STALKED! 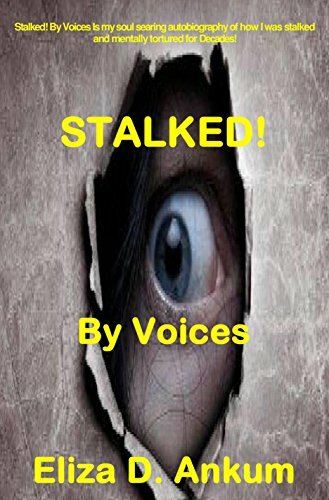 By Voices is my soul searing autobiography of how I was – am still am – being stalked and mentally harassed for decades. In 1976 the word stalker, as we know it today, did not exist. It didn’t become common place in our language until after the horrific murder of TV star, Rebecca Schaeffer. Schaffer was the star of the 1988 sitcom, My Sister Sam. And in 1989, she was shot dead on her own doorstep by Robert John Bardo. According to media reports, at the time of her murder, Bardo, whom Schaffer did not know, had been stalking her for some time. For example this excerpt from the book. Chapter 31 ….. THEY SKINNED ME ALIVE! How can I describe to you what it’s like having your every thought put on public display for the amusement of others? The closest I can come to it, is to say, it’s kind of like having your skin peeled off your body in long painful strips that leaves you feeling totally exposed.